Clowns are frightening beings. From Ronald McDonald to the Killer Klowns from Outer Space, there is absolutely no joy to be had from these demonic beings of pure evil. Am I being irrational? Hardly! Who seriously likes clowns? Because of the public’s fear and distrust of clowns, it’s easy to make them into video game characters, preferably one the player can use as a punching bag. Developers Tendershoot and A Jolly Corpse instead put the player inside the oversized shoes of a clown who loves to hug people. Not since Wayforward’s A Boy and his Blob has hugging been treated as critical gaming mechanic. Dropsy is a clown with a startling appearance. With only three yellowed teeth to his name, he behaves in a manner similar to Lenny from Of Mice And Men. Incapable of speech, Dropsy’s mannerisms and behavior may very well be in response to witnessing the traumatic and fiery destruction of his circus. With no survivors, Dropsy is forced to live on the fringes of society, looking at the world from afar. 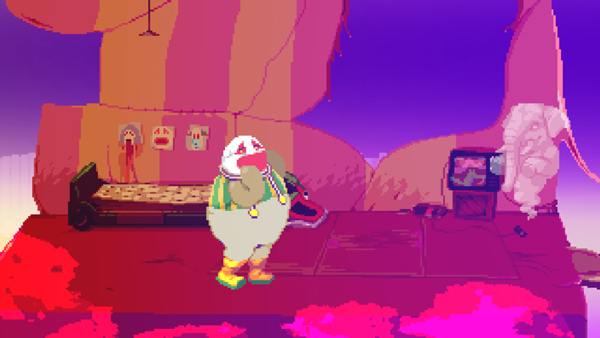 While this might be the perfect setup for a circus-fueled murder spree, Dropsy fights against the stereotype of the “scary clown” and plays the role of social outcast. He wants nothing more than to make people happy, either with hugs or running errands to brighten their day. Dropsy is a point and click adventure game that comes with a major departure from the norm: there is no dialog. Conversations and objectives are presented through icons leaving the player to figure out what needs to be done. It’s a novel idea and it adds another level of puzzle solving. However, the system isn’t perfect. Dropsy operates on the same leaps of logic made famous by LucasArts adventure games. The visual clues can tell you very little if you’re stuck at a particular juncture. There are moments where the game is really good at telling you where to go and what to do but I found myself in situations where I was left to fend for myself. I was struck by a freezing terror similar to that of a child losing their parent in a crowded mall. There is no hint system to speak of (the game has already been updated with some fixes and quality of life features, so there’s potential for a help page to be included later), and I’ve resorted to discussion boards and YouTube videos for assistance. Reddit in particular is visited by the developer who provides hints to confused players, which is pretty darn cool. Dropsy doesn’t brave the world alone, as a faithful puppy follows his every step. By the end of the adventure, he will have accumulated more animal friends to help him solve puzzles and collect hard to reach objects. A classic inventory system keeps track of the items you’ve collected on the way, only in this game, the character stuffs the things you find down his pants. Seeing Dropsy reach inside his trousers to grab something is amusing and highlights the absurdity that defines the experience. The world of Dropsy is presented through the lens of cartoon surrealism. Dropsy and the non player characters are designed in the vein of early LucasArts and Sierra Online adventure games. They comical caricatures of real world archetypes: the overeager cop with a square jaw, a fire and brimstone church lady, executives in smart suits, and a cult made up with Norse-loving vampire hunters. The interesting thing about this world is that it belies something more sinister. The whole game feels developed out of some hard to pronounce Eastern European locale--complete with a Russian-ish victory screen when Dropsy hugs people-- and underneath the layer of warm, happy fuzzies is something out of a nightmare. Case and point: whenever Dropsy goes to sleep in his own bed, he is thrown into a weird dreamscape that animate the random objects filling his ramshackle abode, memories from his past are manifested, and blood. So. Much. Blood. Exiting the dream involves getting wrapped up in a cloud’s tongue and swallowed up. The visual dissonance is ramped up further by an amazing soundtrack performed by Chris Schlarb. The music is gentle and disarming; cheery with the right amount of suspicion. Dropsy offers a unique take on the adventure game genre by stripping away the dialog. This forces the developer to show its story rather than tell it. Of that it does a good job until you’re caught behind a puzzle’s roadblock. Having to backtrack through a decently large-sized map can be tedious, even when fast travel becomes an option. The game’s recent updates show that Tendershoot is committed to addressing any problems and shortfalls. Colorful and surrounded by mystery, Dropsy is a nice twist from “normal” adventure games and worthy of investment.